After the construction of the curli matrix and multi-enzyme complex, what we need to do next is to demonstrate the ability of the enzymes in a simple and intuitive way. An enzyme electrode sensor will be a good choice. The electrodes here can convert the biological signals into an electrical signal and transmit it to a portable instrument for us to use . In our design, by using the curli, gold nanoparticles and Nafion all together, we can amplify and finally collect the catalytic signal of the enzymes through the electrochemical way. In the following, we will explain one by one why every component in this design is necessary and how we use them to construct a well-run biosensor. The multi-enzyme complex relies on curli to connect to the electrodes. 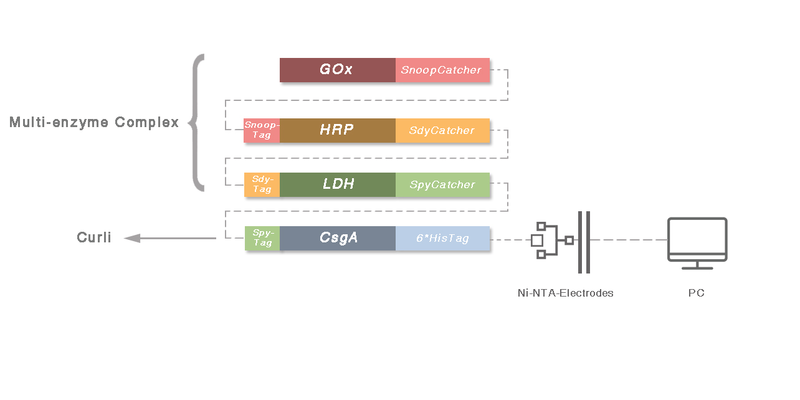 SpyTag is the external interface of the multi-enzyme complex and SpyCatcher is the outer interface the curli matrix. Curli firmly anchors the multi-enzyme complex by the strong covalent binding of the SpyTag-SpyCatcher. As for the gold nanoparticles, these tiny things significantly reduce the resistance, consequently the current created by enzyme-catalyzed reaction can be smoothly transmitted to the electrodes. Moreover, based on the properties of high biocompatibility and satisfactory conductivity, Nafion takes the role of the outermost embedding material, which guarantees the activity of the enzymes and fixes the whole system stably. The curli is a type of amyloid fibers produced by certain strains of enterobacteria. With its excellent biocompatibility and the ability to spontaneously assemble into a dense network structure,  curli fits well with the high demands on enzyme activity as well as coverage density of enzymes in our projects. See more about MATRIX. The conductivity and biocompatibility of Au NP（gold nanoparticles） allow it to act as a "electron wire"in the biosensor. These particles promote electrons transfer between the electrodes and active site of the enzymes, which makes the detection more precise.] Also, the Au NP allowes more freedom in the enzymes' orientation and therefore more sensibility and stability . Nafion is a sulfonated tetrafluoroethylene based fluoropolymer-copolymer, which has superior conductivity. Recently, Nafion has found its great application prospects in the field of biosensors. Nafion has been shown to be stable in cell cultures as well as the human body. We decided to use Nafion to further strengthen our electrodes. We expected Nafion will extend the life of the electrodes while ensuring activity of enzymes. A Detector II Interdigital Electrodes See more about HARDWARE. A Detector Iare formed by the working electrode, the counter electrode and the reference electrode. The task of the working and counter electrodes is to provide places where reactions take place (same as an electrolytic cell), and the reference electrode provides a “zero point”, which is necessary for numerical results (results presented by numbers). By using these all together, we can detect the catalyzation on the electrode surface and transfer it to the workstation. Electrochemical workstations are often utilized in the process of preparing sensors, which can accurately and conveniently describe characteristics of various solutions. One of the common uses is to plot CV curves and I-T curves. In CV (Cyclic Voltammetry Curve), the electrochemical workstation forces reactions to move to the oxidation end and the reduction end successively by applying periodically and oscillating voltages to the electrodes. 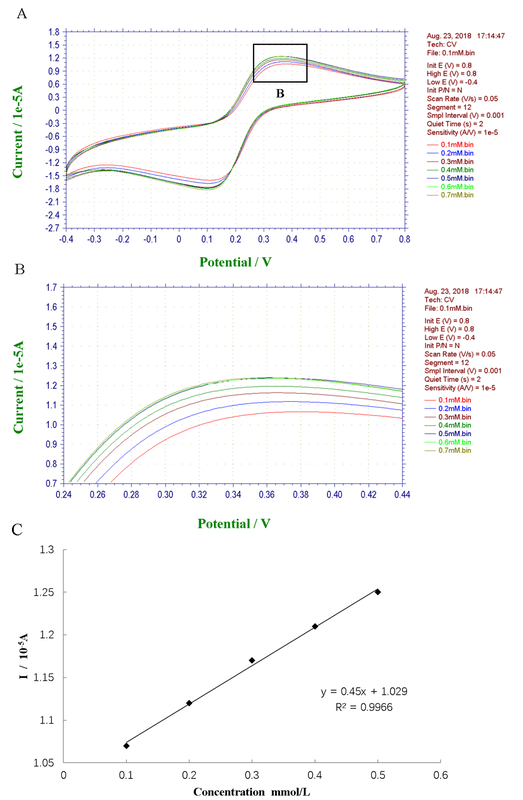 During these cycles, the changes of the current will tell us plenty of characteristics about the occurring reaction For an enzyme electrode sensor, the value of the oxidation peak or the value of the reduction peak of the cyclic voltammogram is linearly related to the concentration of reactant (of course, within a certain range of concentration). After getting the CV curve and plotting a standard cure, this linear relationship allows us to convert the current result of an unknown solution into a concentration result. The I-T diagram (current-time change) is also important. By given a constant voltage (the voltage that push the current to peak in the CV diagram. ), the catalyzing reaction will approach a specific steady state at last. Through the I-T diagram, we can get some information that CV curve can't provide, for instance--how long does it take for the reaction to reach equilibrium, which determines how long it takes to give an accurate feedback after adding the tested substance. The I-T diagram (current-time change) is also important. By given a constant voltage (the voltage pushes the current to peak in the CV diagram. ), the catalyzing reaction will approach a specific steady state. Through the I-T diagram, we can learn what CV curve can't provide, for instance--how long does it take for equilibrium, which determines how long it takes to give an accurate feedback after adding the tested substance. By analyzing the CV curve or the I-T curve, we got the most practical graph - the relationship between the peak value of current and the concentrations of substances-that is, the standard curve. By analyzing substances in a concentration gradient, we knew where the detection had a good linear correlation, which is necessary for real-world detection. In this way, detecting a substance in an unknown concentration only needs to read the peak value of current and calculate the concentration by referring to the standard curve simply. At the very beginning, we used a single enzyme sensor to detect the actual function of A Detector Ⅰ. We measured the function of three enzymes separately (glucose oxidase, horseradish peroxidase and lactate dehydrogenase, which are components of designed logical gate). The characteristics of each enzyme provided useful information for further experiments. Test results were quite satisfactory. This indicated that there was still a large degree of retention of the enzyme activity after modification of the Tag/Catcher system. Figure 4, Figure 5, and Figure 6 illustrate that these three enzyme electrodes worked well. The activity test of the Glucose Oxidase (GOx）sensor. 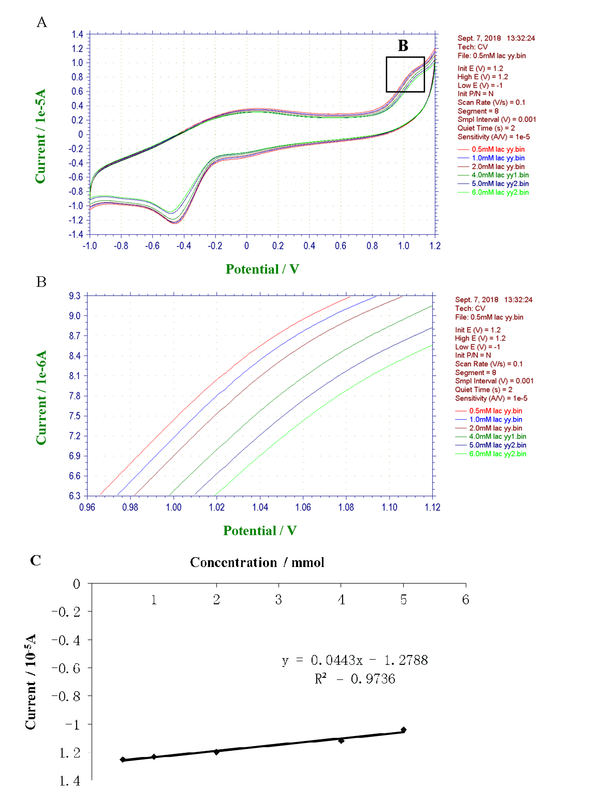 (A) The Cyclic Voltammetry Curve of glucose oxidase had a distinct oxidation peak around 0.3-0.4V, and its height increased with increasing substrate concentrations. (B) Picture B is a partial enlargement of Picture A. The relationship between the height of the peak and the concentration of the substrates could be observed more clearly on the Fig B. (C) Fig. C shows the linear relationship between substrate concentrations and peak currents. The correlation coefficient of 0.9966 indicates that the sensor had a fairly good capability within this concentration range. 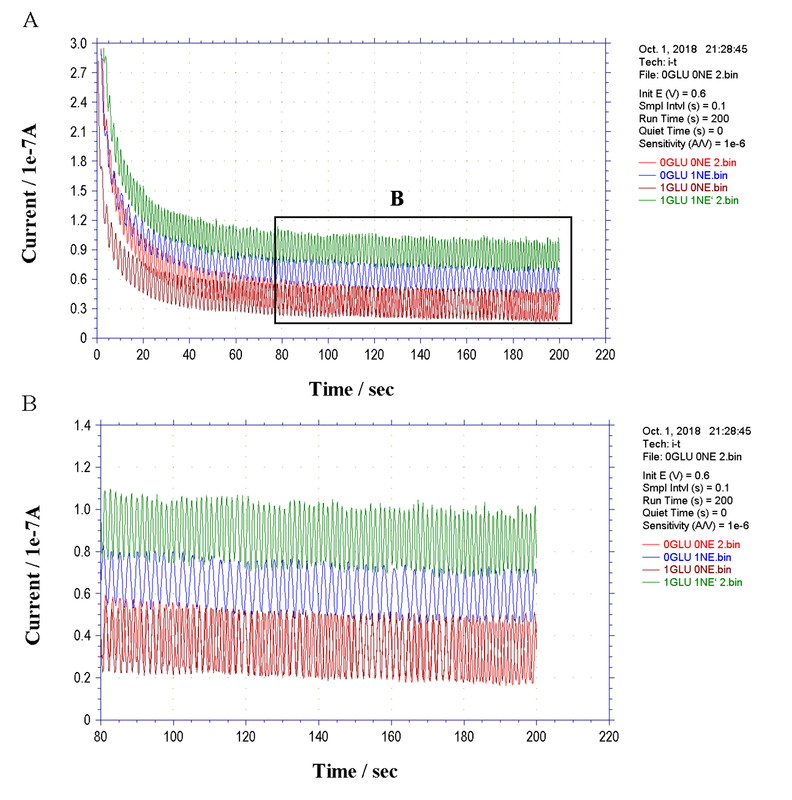 The activity test of the Horseradish Peroxidase (HRP) sensor. (A) Similar to the glucose oxidase sensor, the horseradish peroxidase sensor had a distinct oxidation peak (around 1.0-1.3V) that can be used as an “indicator” of substrate concentrations. (B) Picture B is a partial enlargement of Picture A. (C) Picture C shows a high correlation between peak currents and substrate concentrations, thus it is a satisfactory standard curve. 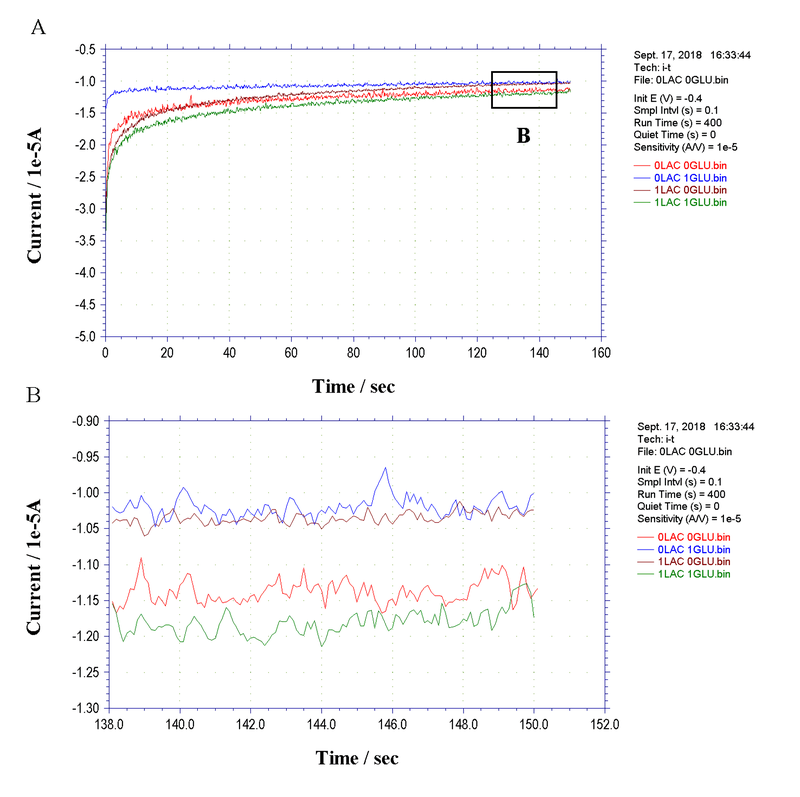 The activity test of the Lactate Dehydrogenase(LDH) (A) The oxidation peak of the LDH sensor was not very obvious, but after calculating, we found that its peak current values still had a satisfactory relationship with the substrate concentrations. (B) Picture B is a partial enlargement of Picture A. Although this oxidation peak was relatively inconspicuous, we could still see it. 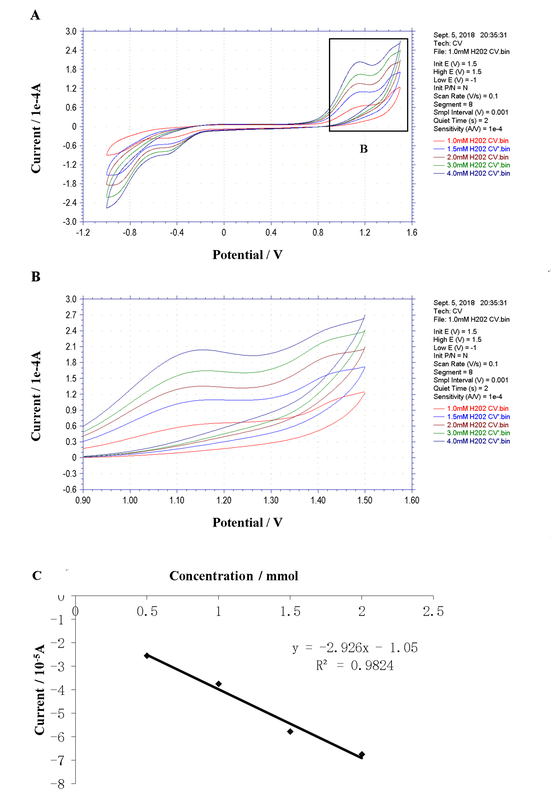 (C) The relatively high correlation coefficient indicates that our sensor had good detection capability in the concentration range of 0.5-6mmol. As we explained in the multi-enzyme complex part, part, glucose oxidase and horseradish peroxidase can be used together to construct an AND gate, while lactate dehydrogenase, glucose oxidase and horseradish peroxidase can be used to construct an XOR gate. Figure 7 and 8 show that both have been successfully constructed. Our project ideas have been implemented. Current-time diagram (I-T) of the AND gate. (A) Picture A shows the I-T curve for different input conditions (0/0, 0/1, 1/0, 1/1). The current was stable at about 80s. In theory, the 1/1 input had the highest current output, and the actual result met this expectation. (B) Picture B is a partial enlargement of Picture A. We could find that the sensor clearly distinguished between different input conditions. The 1/1 input had the highest current output, followed by the 0/1 input, and the other two inputs lower. Different inputs were clearly distinguished, indicating that the AND gate met our expectations. Current-time diagram (I-T) of the XOR gate. (A) Figure A shows the I-T curve for different input conditions (0/0, 0/1, 1/0, 1/1). The current was stable at about 90s. (B) Picture B is a partial enlargement of Picture A. The output of 0/1 and 1/0 were significantly different from (higher than) those of 1/1 and 0/0, which was in line with the characteristics of the XOR gate. We were satisfactory with the results from the first generation of products, A Detector I. However, we cannot DIY our hardware, and the electrodes themselves need to rely on the huge electrochemical workstation, which let us think about the possibility of exploring the next portable generation of products----A Detector II. Wang J, Polsky R, Xu D (2001). "Silver-Enhanced Colloidal Gold Electrochemical Stripping Detection of DNA Hybridization". Langmuir. 17 (19): 5739. doi:10.1021/la011002f. Wang J, Xu D, Polsky R (April 2002). "Magnetically-induced solid-state electrochemical detection of DNA hybridization". Journal of the American Chemical Society. 124 (16): 4208-9. doi:10.1021/ja0255709. PMID 11960439. Daniel MC, Astruc D (January 2004). "Gold nanoparticles: assembly, supramolecular chemistry, quantum-size-related properties, and applications toward biology, catalysis, and nanotechnology". Chemical Reviews. 104 (1): 293-346. doi:10.1021/cr030698. PMID 14719978. Hu M, Chen J, Li ZY, Au L, Hartland GV, Li X, Marquez M, Xia Y (November 2006). "Gold nanostructures: engineering their plasmonic properties for biomedical applications". Chemical Society Reviews. 35 (11): 1084-94. doi:10.1039/b517615h. PMID 17057837. Heitner-Wirguin, C. (1996). "Recent advances in perfluorinated ionomer membranes: structure, properties and applications". Journal of Membrane Science. 120: 1-33. doi:10.1016/0376-7388(96)00155-X.